This CD only recently came my way and is a Hawkwind family tree disc of sorts that many fans may not be aware of. 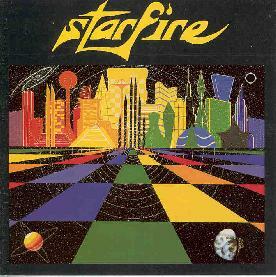 Starfire is a project lead by Doug Buckley who wrote the lyrics for "Out Of The Shadows" (from Space Bandits) and includes some heavy spacerock that Hawkwind fans will love. From Spokane, Washington, the band consists of Buckley on bass, synths, and vocals, Kevin Dodson on drums, Guy Gardner on guitar, Kaaren Kirmaier on synthesizer, and David Cook on effects. "Space Traveller" starts off innocently with a pulsating synth that is quickly joined by a crunching guitar and pounding bass/drum rhythm section. I mean it when I say pounding... Dodson's drumming is furious and really helps keep the adrenalin level high. Once the vocals hit, singing of time, space, and phasing in and out of reality, it's clear that this is 100% pure heavy-hitting spacerock. The instrumental sections are extensive with the guitar blazing and the synths swirling everywhere. Buckley's vocals have a distinct sound and may not appeal to everyone though after several listens I think they fit the music well and certainly contribute to establishing the Starfire sound. One review I read compares him to Geddy Lee, though not quite as high pitched and I think that pretty accurate. "Across The Land" is a similar song with great guitar work. Gardner isn't a flashy technical guitarist. Rather, like so many great Hawkwind tunes he wails and crunches his space metal chords and riffs along with the rhythm section and synths as one part of a greater whole. Starfire also does it's own version of "Out Of The Shadows". The five minute track from Space Bandits has been expanded to a nearly 15 minute tour de force of space metal. The song utilizes its length though to alternate the heavier sections with quieter segments. "Welcome To Now" is a shorter tune and much like the previous tracks. Now we do a complete 360 degree turn. The final track, "Electronica", is 27 minute pulsating synth exploration by Buckley. When I told Doug that I enjoyed the track and liked the contrast with the previous full band tracks he responded, "I've gotten mixed opinions there. I'm a big Tangerine Dream fan as well, and I felt the need to address that aspect of my musicality when issuing the CD". While this is certainly Tangerine Dream style electronica, I wouldn't call it an easy going journey after the heavier full band tracks. The music has a pulsating rhythm that gives the music an intensity that doesn't let the listener relax too much. In summary, Starfire is a must have for those who like the more hard driving metallic side of Hawkwind. Along with Born to Go, these guys are the best example I've heard of a current American spacerock band playing the truly heavy stuff. Buckley says he is currently working toward a new Starfire release. For more information contact Starfire Studios; PO Box 10702; Spokane, WA 99209; Phone: 509-327-2518.